Spring Fever hits Breckenridge! Don’t miss out on the epic sidewalk sales or head up the mountain for the Breck Spring Open competition this weekend! PLUS take advantage of our price drop for lodging this weekend only! (see below for details). The winter season is winding down. Spring is here and the snow is on the melt. Instead of blizzards and pow days, we’re looking forward to blue skies, mild weather and the long days of summer. 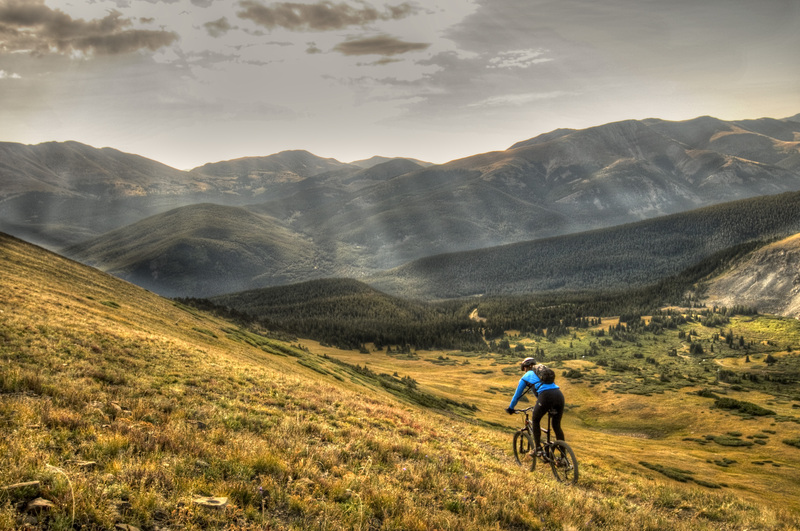 In Summit County summer is a mild season where the temperatures stay in the sweet spot for outdoor recreation. Not too hot, not too cold, but just right. Some of us prefer hiking, camping or fishing, but one of the biggest draws of the summer is getting back in the saddle for another season of biking. Now, up here in the mountains, most people assume that mountain biking is the only discipline. And yes, it does make up a large portion of bikers. But believe us, there’s plenty to do for everyone from the casual rider to the extreme athlete. First thing’s first. No bike, whether a rental or an expensive top-of-the-line model is ready to ride without a thorough tune. Especially when dusting it off for the beginning of the season. SO, here are a few of the basics to cover when making sure your ride is ready to rip. Tires – These are some of the easiest components on a bike to maintain or replace. If you’re running on tires that include inner tubes, make sure that there aren’t any holes in the tube and that there’s plenty of tread on the tire. Making sure that they’re inflated to the proper PSI (pounds of pressure per square inch) will go a long way towards making sure that they don’t prematurely go flat or pop. If you prefer riding on tubeless tires, same basic principles apply. Make sure the PSI is correct, make sure that there aren’t any hidden holes in the tire and more importantly, make sure the seal is airtight. Tubeless tires tend to require maintenance much less often than inner tubes, but they do require a bit of a bigger commitment on the front end to make sure they’re set up correctly. Luckily, here in Breckenridge, there is not a shortage of bike shops. Oil and Lubrication – A bike is a well-oiled machine… Literally. Making sure that your chain, gears and joints have the proper lubrication is very important to keep the bike from rusting prematurely and keeping it operating smoothly. However, keep in mind to wipe off excess oil and lube away from your components as too much can attract a lot of dirt and grit. Gears – Almost all kinds of bikes have shifting gears. They help you be as efficient as possible when it comes to pedaling. However, with lots of use, they can be thrown out of whack. So, make sure to have them realigned at the beginning of the season. This way when you start shifting with your gear levers, you won’t get stuck between gears, knock the chain off, or cause any inconvenience while riding around. Most qualified bike shops will have the tools and the knowledge to do this rather quickly. Brakes – What good is going fast if you can’t control your speed? Brakes are one of the most important components on a bike. These days, there are typically two different types of brakes, hydraulic and cable. Hydraulic brakes use a system of hoses filled with fluid to transfer energy from the brake levers to the calipers whereas the cable system uses a taut wire to transfer that energy. To make sure that your brakes are in great working order, bleed hydraulic brakes (remove bubbles of air from the hose that reduce functionality) and tighten or loosen the brake cables to ensure that they’re in the correct position when the brake lever is applied. Now that we’ve gone over a few of the basics for prepping your bike (keep in mind this is only a handful of maintenance tips, for a true thorough tune, consult a professional shop or mechanic), it’s time to delve into the best spots to ride. A great reference to help you find your way around is: https://www.mtbproject.com/. It’s a crowdsourced site that compiles trails based on popularity and location. Here in Breckenridge there are seemingly endless trails that range from easy to moderate to scary so make sure you know where you’re going before you embark down an unknown trail. Some of the local favorites include Sally Barber (a free-flowing intermediate trail with some ups and downs). The Peaks Trail (which is a bit longer, around 8 miles one way taking you between Breckenridge and Frisco), The moonstone trail (more difficult, primarily downhill with jumps and berms) and The Flumes, which range from easy to difficult uphill and downhill rides. If mountain biking isn’t necessarily your thing, there are plenty of roads to cruise. Boreas Pass Rd. is a grueling climb rewarded with excellent views and a fast, flowy downhill ride. There is also a paved bike trail to and from Frisco (about a 15-minute drive) that is very popular, winding along the Blue River and ultimately Dillon Reservoir. Other than that, feel free to explore town on your bike. Everything is very friendly to cyclers and there are definitely some hidden gems to find through exploration. Make sure you follow the rules of the road on your bike. Uphill riders on trails always have the right of way (unless you’re on a downhill specific trail which will be noted on signs). When riding on a road also used by cars, signaling just as if you were in a car is required. No one is psychic and can read your mind. If you need to make a left-hand turn, point that direction so auto drivers know. Always obey traffic laws and signs and always exercise caution. If you are riding on a trail that is slightly muddy, make sure you always stay on-trail. Riding around mud puddles expands trails and could potentially damage natural vegetation and wildlife. Besides, if you’re not out playing in the mud, where’s the fun in that? 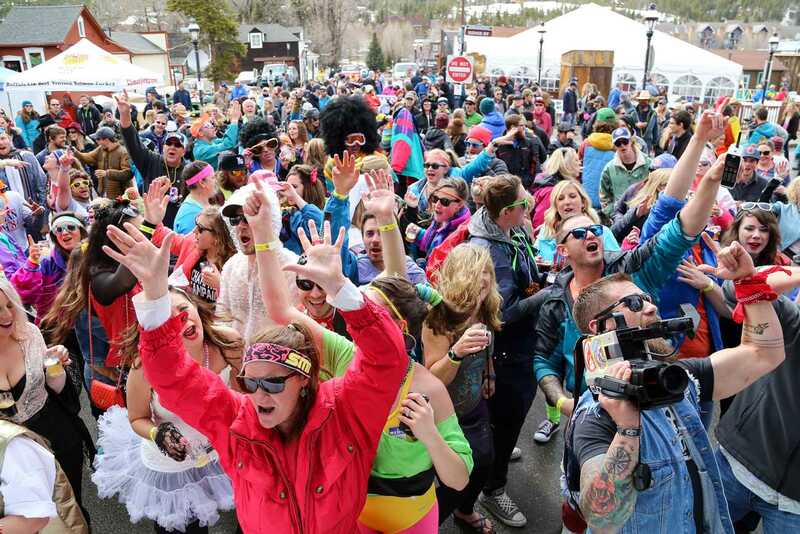 The Breckenridge Spring Beer Festival hits Breckenridge Saturday, April 8th. Read all you need to know about this event below and make sure to get your tickets in advance before this event sells out! The festival is held at 505 S. Main Street, at the Main Street Station in Breckenridge. The Doors open at 12pm. Make sure to buy your tickets online as the first hour of this event is only for pre – purchased tickets. You can pick up your tickets off Park Avenue at the entrance to the Village at Breckenridge. The event will end at 5pm. Breweries will be bringing out special brews the first hour of this event for exclusive pre – purchased ticket holders. Get your tickets online, this event WILL sell out! You may also purchase day – of tickets there (if they are not sold out). *Please be aware there are no refunds. Click here to purchase today! Spend the extra cash and get exclusive access! The VIP tickets grant you to specific VIP entrance lines so there is no waiting around to try that special beer! You will also receive a collector’s mug and full size tasting! Worried about food? Don’t worry, with the VIP access you will also get access to the VIP tent that includes catered lunch, snacks, heaters, view of stage and private bathrooms! There will be a stage and live music at this event. Get your dancing shoes on and meet us for the party! This event doesn’t allow pets so keep the furry ones at home! Bring the kiddos if you would like, however be cautious, this is a beer tasting festival. Keep the bags to a minimum if possible, no camel backs will be permitted. Make sure to bring a water bottle as well and stay hydrated after all the beer! The location is still TBA however, there will be an after party in Breckenridge following this event! Still want more information on this event? Click here to learn more! Rafting is one of the most exciting Breckenridge summer activities and there are quite a few rivers in and around Breckenridge that appeal to rafters of all abilities. The best months for rafting are May and June when the spring runoff is at its highest. There is also plenty of opportunities to raft throughout the summer either with a guide or with your own gear. The Blue River: The Blue River has a pretty short season, usually May through early July before the flows go too low to raft. The Blue runs out of Silverthorne and offers exciting whitewater for those looking for a moderate adventure. The river runs through class 3 rapids and offers amazing views of the Gore and Williams Fork ranges. This river is the closest rafting to Breckenridge and is easily accessible with launches starting just north of Silverthorne. The Upper Colorado: A little further up the road near Kremmling is the Upper Colorado, home to Gore Canyon, one of the most difficult stretches of whitewater in the state (mandatory 10 foot waterfall!). But just downstream is one of the more mellow and beautiful stretches of the river offering small rapids and jaw dropping scenery. 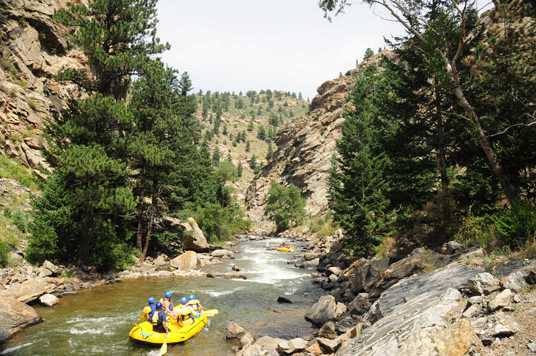 The Upper Colorado is offers the perfect half or full day float for the whole family. Boat launches include Pumphouse, Radium, Rancho Del Rio, State Bridge and more. For anglers the Upper Colorado is a great spot to pull out a few lunkers. Clear Creek: Clear Creek is a short and intense intermediate river that flows down steep drops through Clear Creek County near Idaho Springs. Class 3 and 4 Rapids make up the majority of this river offering nonstop action the whole way down. The easiest put in is right in Town Park in Idaho Springs. You can put in further upstream at Radium but that will increase the difficulty to 4+ rapids. The Upper Arkansas: The Upper Arkansas is probably the most popular river to raft in Colorado’s central Mountains. Centered near Buena Vista and offers rafting for all ability levels. From the easy Milk Run starting in town to the lower sections, Brown’s Canyon for intermediates and The Numbers for experts there is something for everyone. The Lower Arkansas/Royal Gorge: If you are an experienced rafter gear up and take a trip through one of the most challenging and rewarding sections of river in Colorado. Diving through one of Colorado’s deepest canyons, the Arkansas River cuts a fast path and offers class 4 and 5 rapids the whole way. Located near Canyon City this river is not for the timid! By now you are probably thinking that visiting Breckenridge from somewhere else will make it challenging to get on any of these rivers. That’s ok though! You don’t need to bring anything except a bathing suit and some sun block to get on the river. Breckenridge has a few great companies that offer rafting on these rivers. You can book half and full day trips that have lunch included. All trips start in Breckenridge or Frisco and go out with experienced raft guides where safety is their number one concern. Commercial rafting makes it easy. All you need to do is bring yourself! Here are a few great local companies. https://www.bestofbreck.com/wp-content/uploads/2017/03/Tuesday-3.21.17.jpg 1500 1500 Nicole DeCesare https://www.bestofbreck.com/wp-content/uploads/2015/08/logo-332x156.png Nicole DeCesare2017-03-21 15:53:532017-03-22 15:36:12Spring Music in Breck! Warm weather, spring skiing conditions, live music, brewery tours and more! Check out everything going on this weekend in Breck!